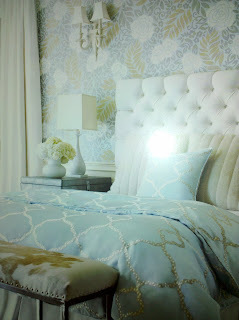 I saw this image on the Thibaut website and just had to share it. This company has been doing fabrics and wallpaper since 1886 and it shows. The wallpaper by Yvette is one of my favorites with its large scale floral design and soft inviting colors. The coordinating fabrics featured are Gibraltar, Strathmore and Cabo Cotton. I love the way they pull the different colors out of the wall creating pops of surprise and intrigue as you scan the room. This room captures the essence of retreat - whether it is the master or the guest room - the lucky boarder is in for a peaceful stay.